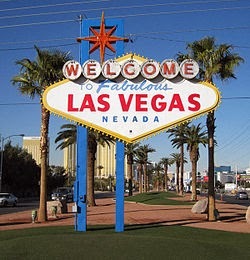 There are three Welcome to Las Vegas signs. One is at 5100 Las Vegas Boulevard south, south of the Mandalay Bay Hotel, another one is at Boulder Strip, just South of the stoic Sam's Town and Nevada Palace casinos and north of Tropicana Avenue. The third is the "Welcome to Fabulous Downtown Las Vegas" sign which is at the intersection of Fourth Ave. and Las Vegas Blvd.